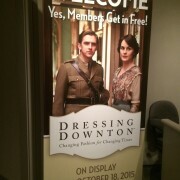 I’ve been a fan of Downton Abbey since it first started in 2011. And why not? Besides the fact that it’s a period drama (centered around a period I studied a lot), and got plenty of good reviews, it starts with the sinking of the Titanic. Of course I had to watch! It definitely did not disappoint. 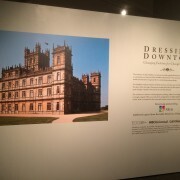 While some seasons of Downton are better than others, they’re all very good. It’s definitely a soap opera, and some fairly ridiculous things happen, but the dialog is snappy and fun and the costumes and period ambiance are gorgeous. Even Saturday Night Live couldn’t ruin it for me… at least not completely. 🙂 My biggest disappointment, perhaps, would be that it moves so quickly through time, traveling from 1912 in season 1 to currently 1925. It’s interesting to see so much of British (and by extension American) history in such a short time, but I also wanted them to spend more time in the earlier periods. Now in its sixth season, it’s starting to wrap up all the overly dramatic storylines in a nice little bow. I admit I’m behind, having only seen the season 6 premiere so far, but they’ve already tidied a few dust ups, just within that one episode. But that’s fine with me. (I’m particularly glad they got rid of that blackmailing woman, who already annoyed me after her first scene.) 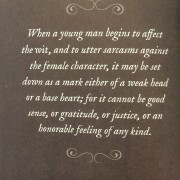 I enjoy that it’s not always so melodramatic. 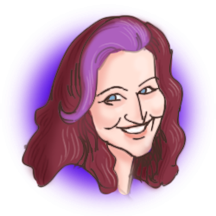 Life shouldn’t be so awful, and it’s only really that awful for people on a TV drama (especially a teen drama, like Finding Carter…but I digress). 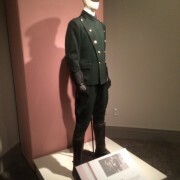 While in Virginia for the Thanksgiving holiday, we decided to go to the Virginia Historical Society. 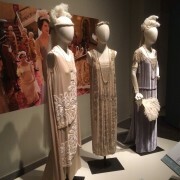 They’re located across the street from the Virginia Museum of Fine Arts, our original destination, but the VHS had a special exhibit, Dressing Downton, on the costumes of Downton Abbey. Informative and beautiful, though a little expensive, it was too cool to pass up. My only disappointment is the shocking omission of Lady Sybil’s pantaloon outfit, which is a fashion highlight of the whole series. 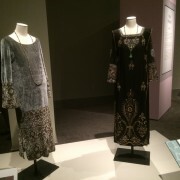 It’s a traveling exhibit, so check to see if it’s coming near you. 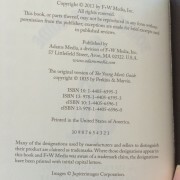 In the meantime, I took a number of pictures to share here. 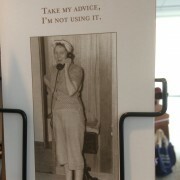 (There are a few pictures from the gift shop, and from the VMFA too.) Enjoy! 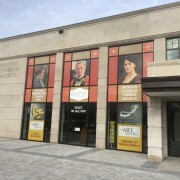 The entryway to the exhibit. 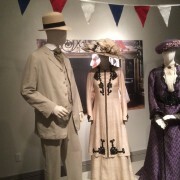 Robert and Cora Crawley, and the Dowager Countess. 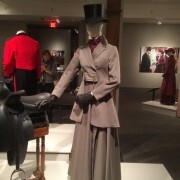 Season 1 Lady Mary’s hunting outfit, including the side saddle. 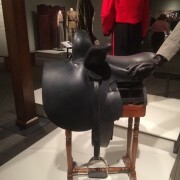 The side saddle. I confess I didn’t realize it was a special kind of saddle (I know nothing about horseback riding), and I don’t know how these things work, so it’s fascinating to see. 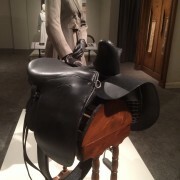 Another angle of the side saddle. Season 1 Anna dresses Mary for dinner. 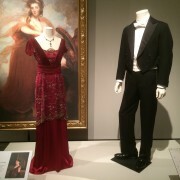 Lady Mary and Matthew, Season 1. 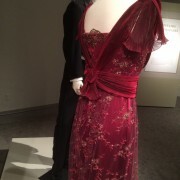 The back of Lady Mary’s gorgeous red dress. Stunning. 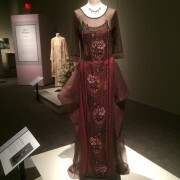 Another of Mary’s beautiful dresses (front). 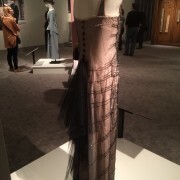 Another of Mary’s beautiful dresses, from the back. 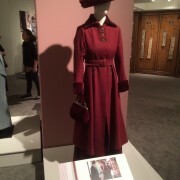 Lady Mary’s traveling coat. Mary really gets all the best outfits. 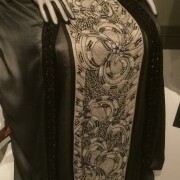 One of Lady Sybil’s dresses. 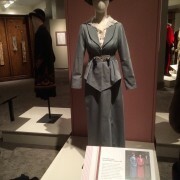 The only disappointment of this exhibit is they did not have Sybil’s pantaloon outfit, practically the fashion highlight of the show. 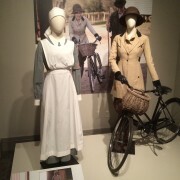 Lady Sybil’s time as a nurse, and Lady Edith’s bicycle-riding outfit. 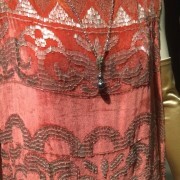 One of Cora’s beautiful gowns, with its exquisite beadwork. 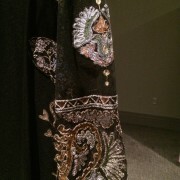 A closeup of that exquisite beadwork from Cora’s gown. 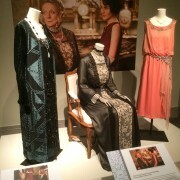 A trio of gowns, worn by Cora’s mother, the Dowager Countess, and Edith (l to r). 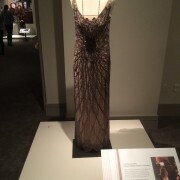 A closeup of the Countess’s beaded gown. 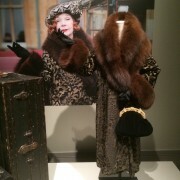 Cora’s mother (Shirley MacLaine) visits, wearing this gorgeous fur. 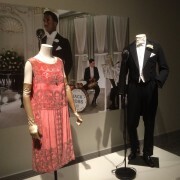 Rose wears the latest 1920s fashion, and flirts with the bandmaster in his tux. 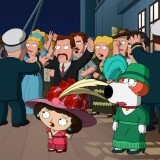 Rose and Cora (and Freda Dudley Ward) at Rose’s debutant ball. 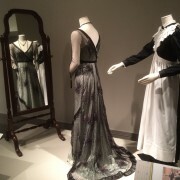 Lady Sybil’s maternity gown (l), and the gown Virginia Woolf wore in her very brief appearance in Season 4. 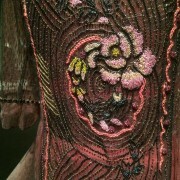 A closeup of the sleeve of Virginia Woolf’s beaded gown. 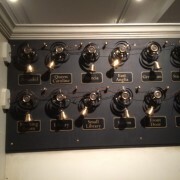 The wall of bells that rang from the different rooms down to the servants quarters. We could pull on the cords and ring the bells ourselves. 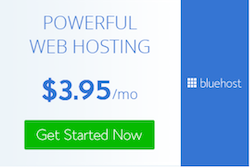 …like this one. 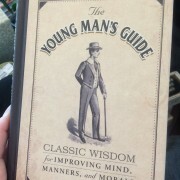 I especially love this page of that Young Man’s Guide. 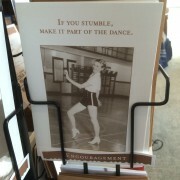 Another greeting card in the gift shop, with a great message. 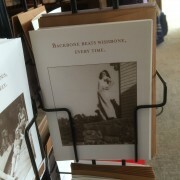 One more greeting card in the gift shop (and something I do all the time). The posters hanging outside that beckoned us. 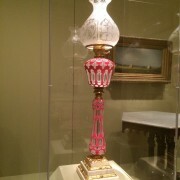 This lamp is from the Virginia Museum of Fine Arts, but it was so beautiful I had to take a picture. 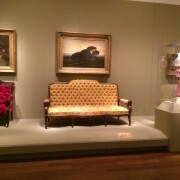 Another picture of the lamp, next to a gorgeous gold couch and a red chair. 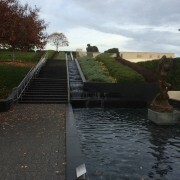 The waterfall in the sculpture garden at the Virginia Museum of FIne Arts. I love the show and was excited for the wedding this week. 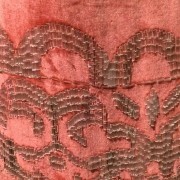 They have such incredible clothing! I know, the costumes are so gorgeous!